Happy Tuesday, everyone! I’ve been absent from blogging and social media for a while due to personal reasons. Something that has been helpful in keeping my mind busy is getting ready for Hmong New Year. I have a lot of projects that I want to finish before December. I’ll try to post about one of them by next week. These tough times renewed my love for cross-stitch embroidery and remind me of my own obsessive tendencies. I’ve been a fan of Hmong Sister Shop‘s designs for a while now and I was ecstatic to hear about Zam Instyle. Even though I would spend a lot of time admiring the pictures on Facebook, I had some second thoughts about ordering from overseas. Shipping would expensive and I might not like it enough. Would it be worth it? Also, I have to admit, I have a lot of Hmong clothes already so do I really need more? Zam InStyle is a company that strives to become a distributor to connect overseas sellers with customer’s in the states. They sell and rent Hmong clothes. I loved that idea and jumped at the chance to help them with their inventory shoot. In the midst of difficult times, I needed a little emotional break. Dolling up and getting dressed in Hmong clothes always brightens my day. Dressing up in Hmong clothes always back fond memories of my great-aunt. 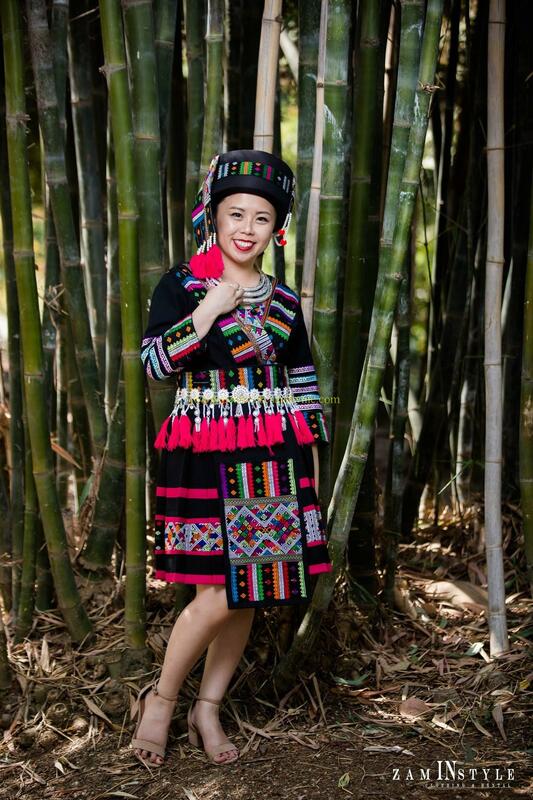 It reminds me of the past when my great aunt would request us to come over, get dressed in Hmong clothes, and take pictures. I miss how her face would light up. This is one of my favorite outfits. I loved the royal blue and the embroidery. Personally, I would pair it up with one of my custom made white skirts instead since it flairs out more. I can’t wait to get a hat similar to this though. This outfit reminds me of one that Yasmi wore before. I found out that I’m not too fond of these box pleats but I loved how colorful this outfit is. The inventory is quite diverse with a lot of modern designs. I always joke around that I’m an old lady stuck in a young body so I prefer more traditional designs but I love seeing new designs. Thank you for reading! Please tell me in the comments below which outfit is your favorite. Oh wow, these are ebautiful! I’ve never seen anything liek them before, you look so happy and lovely in them all. I’m sorry to hear you’ve been having a tough time lately, it’s great you could get a little boost and have some fun with these outfits. Hope things are looking up for you soon and that you’re having a lovely weekend!